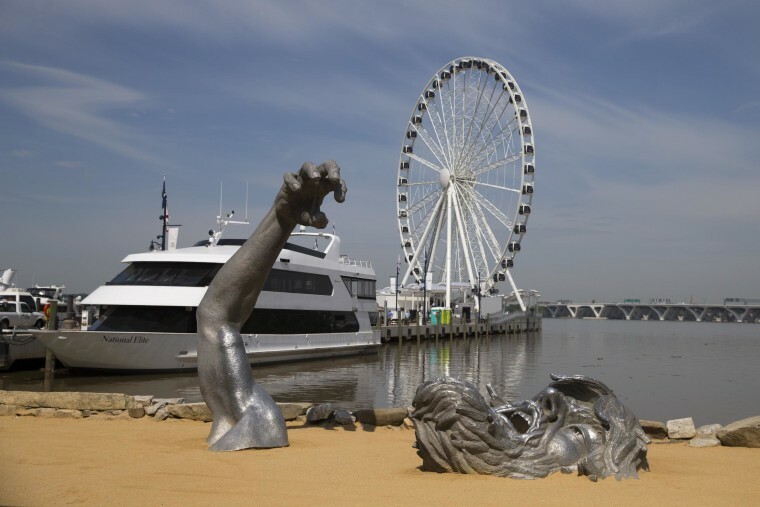 Maryland's National Harbor Aims to Be Fun Alternative to D.C. While visitors to the nation's capital usually head to the monuments and museums, a new attraction uses the Potomac River to draw visitors downstream to a growing destination in Maryland. A mini-city called National Harbor has risen over the past eight years on a long-empty site. The village of shops, hotels, restaurants and public art was built between the river and the East Coast artery of Interstate 95. Its features are inspired, in part, by those of great cities, such as Rome's Spanish Steps and Barcelona's pedestrian mall La Rambla. Water taxis ferry visitors to the National Mall, historic Alexandria, Virginia, and Washington Nationals baseball games. In the evening, families can stroll by boutiques or a ride a carousel. Boaters can dock for dinner, choosing from more than 30 restaurants. Everything is neat and new, and none of it existed a decade ago. The newest attraction is opening in time for summer: a 180-foot (54-meter) Ferris wheel built over the water, inspired by similar wheels in London and Paris. The $15 million Capital Wheel features views of Washington in the distance, as well as the river. Its 42 air-conditioned gondolas hold a total of 332 people. Developer Milton Peterson, whose company invested $280 million to build National Harbor, said he's working to balance seriousness with some fun in Washington's tourism scene. "You show a child three monuments, four statues and a garden, and they say, 'I love Air and Space.' But then they say 'Dad, when are we going to have fun?'" Peterson said. "Washington is just fabulous — it's our nation's capital, and I call it the world's capital. ... But the great cities of the world are usually on rivers, and they use them. We don't use the Potomac like we should." National Harbor began with a convention center and 2,000-room hotel that opened amid the Great Recession. Since then, the harbor has added paddle boating and waterfront activities. The National Children's Museum moved here from Washington. Officials said visitor numbers total 8 million to 10 million annually. "We're just now hitting our stride," said developer Jon Peterson, estimating the Capital Wheel should draw a million riders its first year. "The kids are going to go crazy ... We know what the Washington region is demanding — it's entertainment."